The Breedt Design Rear Torque Mount is a true work of art and suits all Mk6 and Mk7 Fiesta including the new ST180. Fully CNC designed and twin housing allows the choice of either of the included medium or hard bushing. What does this Rear Mount do? This RMM reduces wheel hop, increases traction, enhances shifting feel, and most importantly, gets the power down better all with still retaining near stock NVH. All Breedt products are 100% made in the USA and all hardware is included for perfect easy DIY fitting. Pumaspeed 100% recommend and use this on all their high performance Fiestas Including the 245R and the X-27 powered ST300. The Pumaspeed Workshop team are ready to fit the Breedt Fiesta Rear Motor Mount / Torque Link in our Head Office located here. Therefore making parts and labour a total cost £173.94 (inc. VAT). 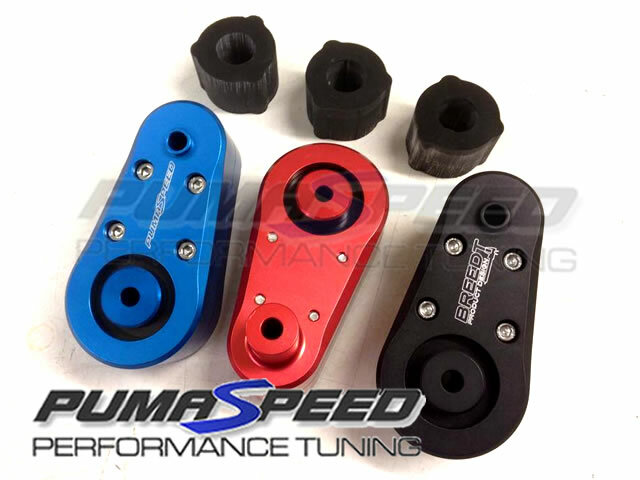 Pumaspeed have a specialist distribution team that can dispatch the Breedt Fiesta Rear Motor Mount / Torque Link to any destination worldwide.